There is no doubt that Aussies love a road trip. The outback highways and scenic coastal roads of Australia are made for driving holidays. Another country that is ideal for a road trip is the United States, a destination that has its own share of unique natural landmarks, quirky small towns and isolated desert highways. Of course, we have all heard of the classic Route 66 and California's Highway One, but there are many small towns and vast national parks not often explored by other international tourists. If you are looking to travel through the heartland, follow the trail of famous rivers and see the remote beauty of the Great Plains, here are some ideas from VroomVroomVroom so that you can start planning your trip to America. 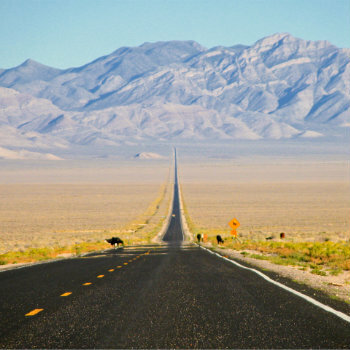 For more information you can see our US article recommending local road trips. Follow the jagged course of the Mississippi as it winds its way through America's heartland. If you're looking to discover the United States beyond the postcard-worthy skylines of New York City and San Francisco, this is the highway for you. The Cathedral of St Paul is located in Minnesota's capital city, just south of Minneapolis. The cathedral was designed with a noticeable French Renaissance theme, and is the third largest of its kind in the United States. Clarksdale, Mississippi makes for a worthy stop along the road. Listen to the famous blues music that went around the world, and visit a number of museums paying tribute to the musical history of Mississippi. In the small riverside town of LeClaire is a museum focused on life along the Mississippi. The Buffalo Bill Museum gives visitors a chance to learn about the history of the region and how the area developed over time. 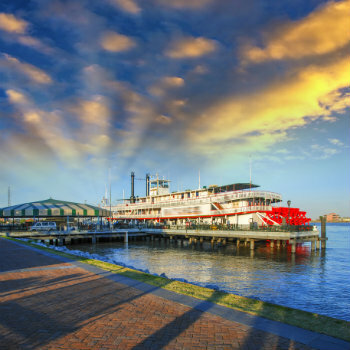 Explore the oldest section of New Orleans; the fascinating French Quarter. New Orleans is also a city famed for its contribution to music, and you can enjoy the sounds of jazz along the unique streets or in some of the great local bars. Discover the mysterious and unexplained events that draw hoards of travellers to Nevada's isolated desert. Follow the Extraterrestrial Highway into the unknown, a route that has become increasingly popular with tourists who leave tributes on the road signs. The area is also home to the secretive Area 51, a must-see destination for conspiracy theorists. Originally Nevada State Route 375, the road became popularly known as the 'Extraterrestrial Highway' after a number of reported UFO sightings in the area. For an out-of-this-world adventure, head deep into Nevada's isolated desert and try to discover the secrets of the mysterious region. Visit Rachel, Nevada. The town is the closest community to Area 51, a spot holding a particular fascination for many people around the world. The town also offers amenities you may need for your journey. The Little A'Le'Inn offers accommodation and meals for travellers in a supernatural-themed venue. Don't miss out on seeing the Crystal Springs ghost town. Despite the town being empty, it makes for fantastic photos and an interesting stop along the Extraterrestrial Highway. Coyote Summit offers great views over the endless desert landscape below. For any aviation enthusiasts, the observation point is a preferred place to spot military jets. To escape the bustling cities and get lost in the wilderness, you cannot go past Oregon's Columbia River Highway. The area is home to some of the most beautiful scenery in the northwest, with the mighty Columbia River cutting through the mountains and cliffs, leading to a number of waterfalls. The scenic highway is just over 100 kilometres in length, with many easily accessible stops along the way. Enjoy the view from incredible lookouts and learn about the native wildlife and unique fauna. A great time to visit the area is through autumn when the colours are at their best. Stop in at the Portland Women's Forum Scenic Viewpoint, which offers fantastic views over the Columbia River. From the clifftops you can enjoy a scenic panorama of the river and surrounding mountains. 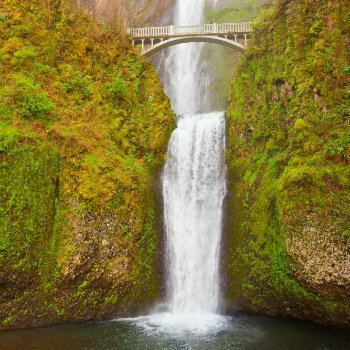 For an unforgettable view, stop in at the Multnomah Falls, one of the highest in the country and definitely one of the most beautiful. Be sure to snap a picture of the Benson Foot Bridge with the huge waterfall in the background. Cross the Bridge of the Gods from Oregon to Washington state. The bridge is located close to the Bonneville Dam. Visit the Columbia Gorge Discovery Centre to learn more about the history of the area and some of the unique natural landmarks. The discovery centre is located about an hour and a half east of Portland. 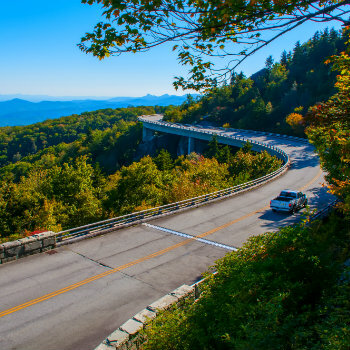 Connecting the thick forests of North Carolina's Smoky Mountains National Park with the colourful landscapes of Shenandoah National Park in Virginia, the Blue Ridge Parkway has become a popular drive among Americans. Explore more than 400 kilometres of unforgettable highway, winding its way high through the mountains. The area is home to a number of historic sites, and you can learn more about them through the region's visitor centres and interactive experiences. Follow Skyline Drive through the beautiful Shenandoah National Park for some brilliant views. Visit the unique Humpback Rocks in Virginia, an impressive collection of large rocks surrounded by a number of hiking trails. A museum in the area can give you an insight into the history of the region. Follow some of the scenic trails in North Carolina's Doughton Park and see what wildlife you can spot. You may be lucky enough to catch a glimpse of deer and foxes. Finish your journey in the stunning Smoky Mountains National Park in North Carolina.